Do you know those people who get up at 7.30 on a Saturday to do bootcamps, hill sprints and marathon training? I know those people. I am not one of those people. I like to have fun on a Friday night (OK, I quite like pizza, a film and a glass of wine sometimes too) and on a Saturday morning there is nothing better than sitting on the sofa with a mug of coffee, a book and some toast. 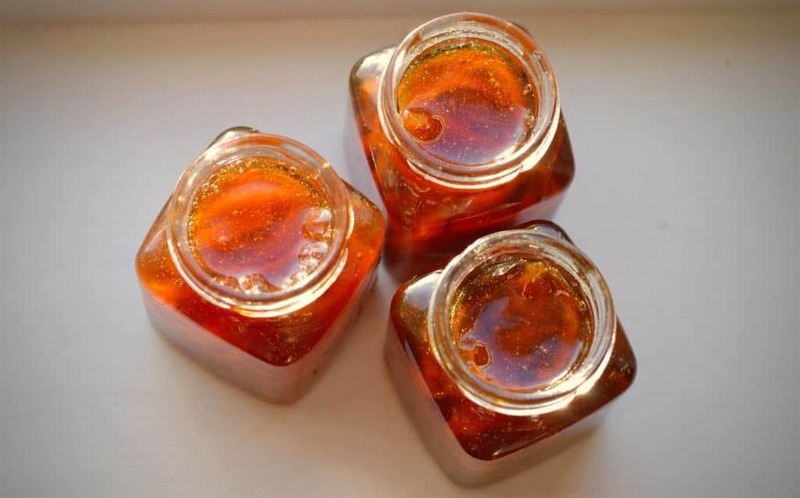 And since we all know that toast is better with something on it, I make marmalade. Seville orange and gin marmalade, to be exact. 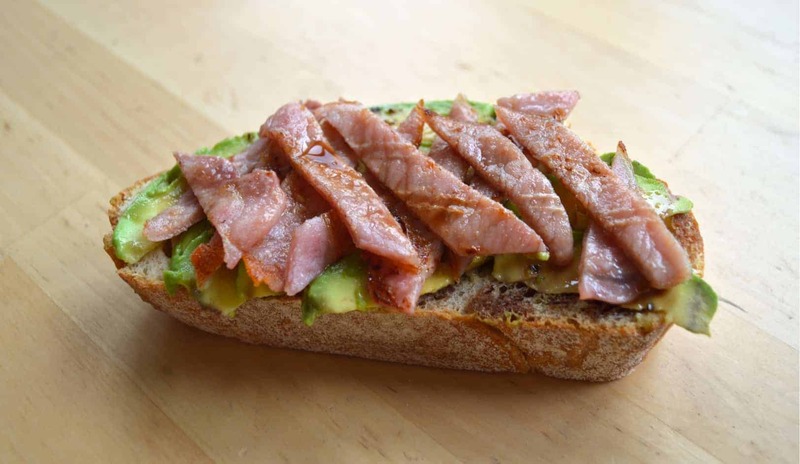 I make it so I can sit crunching on a bit of toast (or maybe a bagel, don’t say I’m not wild…), putting the world to rights by looking at photos of dogs on Instagram, immersed in a thriller or sort of paying attention to Saturday Kitchen. This makes hillsprints sound even less appealing; who knew that was possible. 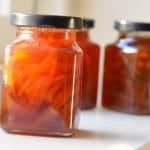 The other reason I like marmalade is because it is so easy to make. You just need a couple of hours, some jars and the fruit. For me, this was a Sunday morning of multitasking (something I confess I am not good at). But it was the men’s final of Australian Open so we’d rescheduled Sunday morning tennis playing and I was listening on the radio and making marmalade. Indeed, I am the cool kid on the block. Yes, my domesticity knows no bounds. Except of course I am awful at multitasking and somehow managed to make my marmalade way darker than it’s been before. Did I somehow manage to burn the sugar dissolved in water? Who knows, but the flavour is still exactly the sort of tartness I was looking for, so I won’t berate myself too much. And if you’re thinking I’m a hypocrite for knocking early Saturday rising fitness people then playing tennis on a Sunday, let me reassure you by saying I regularly struggle to get there for 11. The marmalade and my sofa are just too much to leave. This recipe is adapted from BBC Food, with the gin added in to make it more interesting. It takes about two hours to make (plus cooling time) and makes about five 250ml jars. Wash the oranges and put them in a large pan along with the water. Bring it to the boil and then reduce the heat to a simmer; leave for a 3/4 of an hour, or until the fruit is soft (the length of time will depend on the size and ripeness of your oranges). Whilst the fruit is softening, wash your jars in hot water and then dry, upside down, in the oven (about 100ºC), along with the lids. Put a saucer in the fridge to cool – it’ll be used for determining if the marmalade is set. Remove the oranges from the pan and set them aside to cool. Keep 1 and a half litres of the cooking liquid, ditch the rest. Half the oranges and scoop out the innards, putting them into a bag made of muslin. 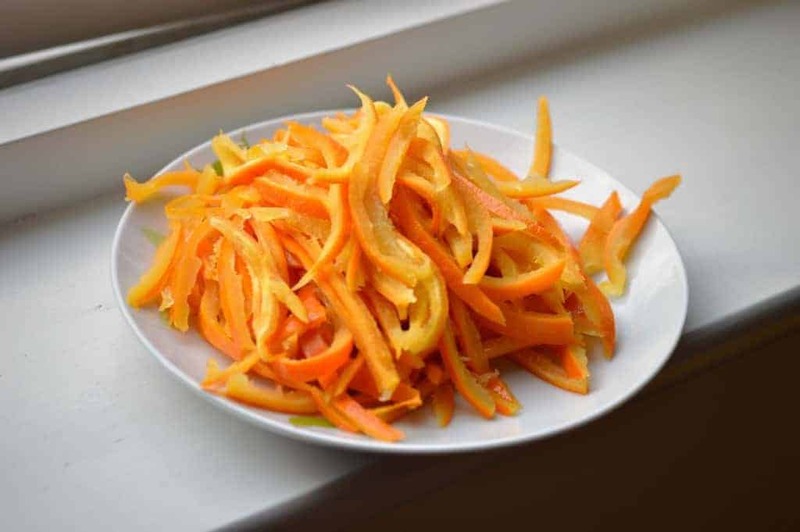 Take the rinds and slice them thinly (or as you like your marmalade). Put the peel into the pan and set it on a low heat. Add in the sugar and stir until it is entirely dissolved. Add the muslin back of the flesh and the gin. Turn the heat up so that it boils. Boil for 15 minutes, skimming off any scum that comes off the oranges. To test the setting point, drop a little of the marmalade on to the cold saucer (that you put in the fridge earlier). Leave it to cool for a few moments, then run your finger through it. If it wrinkles around your finger, or up ahead of it, then it’s ready. If it doesn’t, continue to boil. Test it every 3-5 minutes. It can take up to half an hour to set, depending on how quickly the liquid boils off. 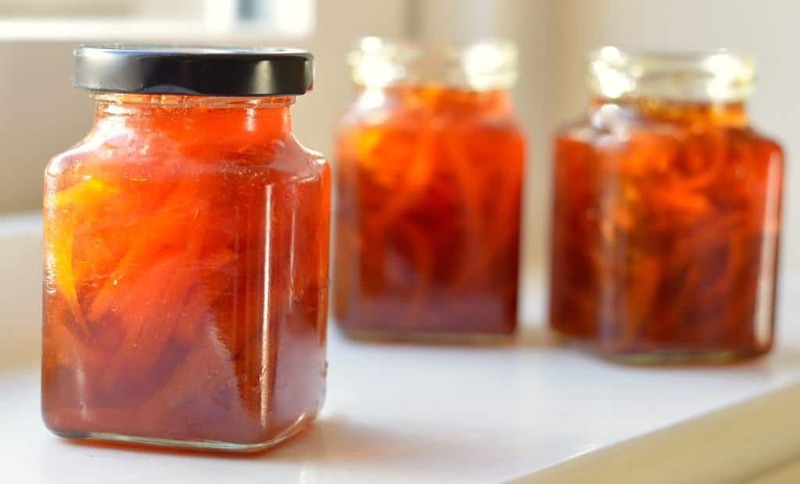 When the marmalade is ready, remove it from the heat and ladle it into the sterilised jars, leaving a little gap at the top. Put circles of grease-proof paper into the top of the jars and leave to cool. Don’t put the lids on until the jars are fully cooled.